Conceived to provide for four or five people comfortably, Le Jas has a large living room which is part lounge and part kitchen, fullly furnisched. Le Jas propose two bedrooms, the first one with a double bed (140 cm wide); and the second one, with 3 single beds (80 cm) or a queen size + a single bed, at your choice. This bed room has a direct access to the terrace. Le Jas provide a large bathroom with a bathtub and an independant toilet. A nice piece of land surround the house dor your nap, reading time and meals. 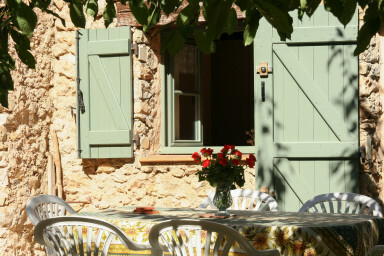 Enjoy the famous Way of Life in Provence !